One Year (6 Issues) of Rodding USA magazine's PRINT version purchased by you and delivered to a loved one, friend, family member or hot rod buddy. One Year (12 issues) of Rodding USA magazine. 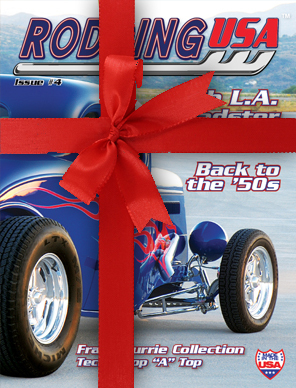 One Year (6 Issues) of Rodding USA magazine's PRINT version is the perfect gift idea for the car guy in your family or circle of friends. It's a gift he'll remember you for each time it arrives in his mailbox.